We have had some excellent homes and condominiums added to the real estate market the first week in July in Aspen. 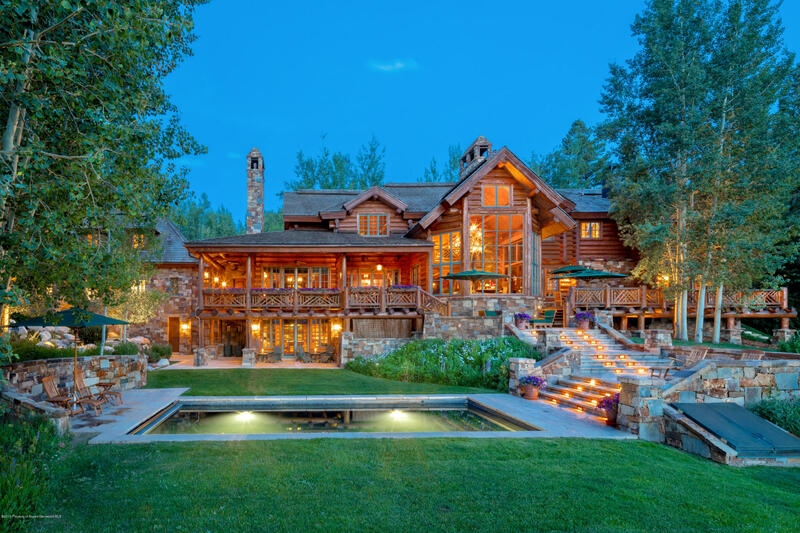 A fabulous log home in Eagle Pines Subdivision near the Buttermilk Ski Area, located at 277 Eagle Park Drive with 5 bedrooms, 8 baths , over 11,000 square feet situated on almost 4 acres was listed 2 days ago for $17,950,000. It was built in 1998 and has a 3 car garage, classic finishes, a modern style. The lovely patio is great for entertaining guests and family while the kids swim in the backyard pool and hot tub. The home has expansive mountain views of Mount Sopris and the Owl Creek Valley. 170 Falcon Road located in the Five Trees Subdivision near the Aspen Schools and Aspen Recreation Center near the base of Aspen Highlands was listed for $13,500,000. This home was built in 2005, has 5 bedrooms, 9 baths and almost 9,000 square feet on 1.5 acres. The home was imagined by Tim Hagman a local Aspen Architect in a Tuscan style with exceptional privacy and extraordinary mountain views of Tiehack. Enjoy the stone patio, wine tasting room, media room and Aspen’s world class skiing just a few minutes away. 350 Lake Avenue located in Aspen’s famous West End was listed last week for $9,450,000. It has 5 bedrooms, 6 baths, 2 car garage, 5,500 square feet, and was built in 1994. Located just a few blocks from Aspen’s Music Tent and Triangle Park. This home has a grand entry room and excellent views of Aspen Mountain. The master bedroom is located on the second floor with a media room on the main floor with a bar, hot tub and 3 additional guest bedrooms. A one bedroom, one bath condo located in Hunter Creek was listed for $525,000. It has 595 square feet, was remodeled in 2015 with stainless steel appliances and fresh paint. Creek sounds can be enjoyed just outside this property as well as the local pool and hot tub. 404 Galena #212, a studio condominium located in the center of downtown Aspen at the Independence Square was listed for $399,950. Just 1 block to Aspen Mountain Gondola, this studio is the ultimate in convenience. Fly to Aspen, drop your suitcase off and head outdoors for fun, sun, skiing, biking, hiking and the best food in the world. How about a 5 bedroom single family home located just a short walk to downtown Aspen? This lovely home offers room for the family, guests and is excellent for entertaining along with views of Aspen Mountain from the living area and master bedroom. At $5,395,000, over 4,000 square feet with modern finishes and offered fully furnished this home is an excellent value. Looking for a new home in downtown Aspen? For $14,950,000 you can be the proud owner of a 4 brand new 4 bedroom, 5 bath, 4,860 square feet, 2 car garage home with all the bells and whistles. Have dinner on the back patio while enjoying your own private pool, water feature and fire pit. The lot next door may be purchased along with this home to provide additional privacy for a combined price of $19,950,000. $8,450,000 is the list price for 1455 Red Butte which has 6 bedroom, 8 baths and just under 6,000 square feet. The home was built in 2004 and remodeled in 2008. The main house has 4 bedrooms, the guest house 2 bedrooms perfect for extended family or friends vacationing together all with a park-like yard. One of Aspen’s most famous streets for fabulous real estate is Willoughby Way. A new listing on this street has 6 bedrooms, 10 baths and just 11,000 square feet built in 1991 on 2.4 acres. Enjoy the outdoor pool, hot tub, pond, waterfall and patio with your closest 100 friends. Large windows bring the outdoors in with views of downtown and the ski area. All of this for the discerning buyer and $39,750,000. Lastly a remodeled condominium in the heart of downtown Aspen at South Point. With 2 bedrooms, 2 baths, 980 square feet, this could be an investment for the future at $1,525,000. There is a possibility of a new development and ski access just behind this complex which could drastically increase the value. South Point offers an elevator and this condo has been updated throughout with new a/c, new bathrooms, new paint & carpet. For more information on any of these properties or others in the Aspen Area give us a call today!